In our house, we’ve been using the set of knives we bought over 20 years ago. The chef’s knife, that we use most often, is getting too hard to sharpen, and has always been too heavy. We also need a good serrated knife—we’ve been substituting with a steak knife. Making salad is usually a job for the kids, and we need something better. My husband asked me to do a little research on knife purchasing. How many knives do you really need? 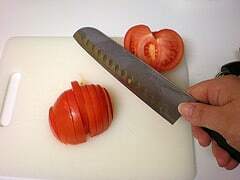 Most sites recommend a minimum of a 10-12 inch chef’s knife for onions, cucumbers and other hard vegetables, an 8-10 inch serrated knife for tomatoes and bread, and a short paring knife for more detailed knife work like peeling. Some sites also recommended a medium-sized utility knife. A Santoku knife, a partially serrated Japanese chef’s knife, is quite popular now. Of course, the sky’s the limit, so unless you are semi-professional avoid single-purpose gadgets. Should you buy eastern or western style? Eastern knives are sharp on only one side of the blade and have round handles. The tang and blade are two separate pieces of metal forged together. (The tang is the metal strip that is encased in the handle.) Sharpening takes longer, but can be done less often. In western knives, the tang and blade are all one piece. The blade is sharp on both sides, and the sides of the handle are flat. They need to be sharpened more frequently. How do you choose among different sizes and brands? This is an individual decision, and largely depends on the size of your hands. If you can find a store that lets you try out different knives, you can get a good feel for the weight and feel of the different types. How will you sharpen the knife? 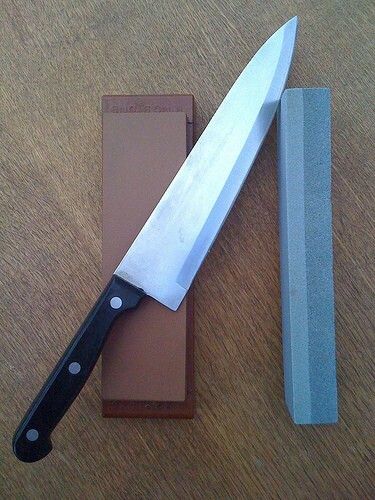 You can use a sharpening stone, or a sharpening steel. There are electric versions as well. Where will you store your knives? Knives get dull if you leave them loose in your cutlery drawer. If your knives don’t come with one, get a butcher block for the counter, or this handy Bistro Universal Knife Block, that doesn’t limit you to specific sizes. Short on counter space? Try a knife holder that fits in a drawer. Or hang a magnetic knife bar on your wall. How will you maintain your knives? Make sure your knives fit your lifestyle. Some knives must be washed by hand and dried after use or they will corrode. If people in your house are likely to neglect this task, choose accordingly. Are you happy with your knives? Please share your tips and recommendations in the comments. Tips on Knife Maintenance According to this site, a steel only works when the knife is still somewhat sharp. If it’s totally blunt, you need a steel. Leah, and I fixed the link. Thanks for pointing it out. Wusthof make great knives. I first learned about them from The Pioneer Woman. She always raves about them, so I bought one the next time I needed a new knife. I’m very satisfied. Thanks for the recommendation, Sherri. We have a set of Forschner knives. A Chinese-style knife for serious chopping and general butchery, a bread knife, and a small paring knife. We generally sharpen them at home (we have both a stone and a steel). A few years ago, when we had neglected the task and the knives became quite dull, we took them to a local butcher who sharpened them professionally. They were good as new. Surprised no one has mentioned this– Cutco knives are awesome. Expensive, but lifetime guaranteed– you can send ’em back for sharpening forever. Beware salespeople and sets, because they will try to convince you to buy more than you need– and wait for a sale. I’ve engraved the blades because I don’t want to take the chance that the company will mix my knife up with someone else’s (traif) one if I need to send it back.